Authorities in northwestern Arizona say a man has died after his car was swept into a flooded wash bed. The Mohave County Sheriff’s Office says a rescue helicopter located the body of 34-year-old Joshua Allen Carlisle of Golden Valley on Thursday about 2 miles (3.2 kilometers) from where his vehicle went into the wash during a storm. Deputies say they had received reports late Wednesday of an SUV becoming submerged. A water rescue team found the vehicle a little over half a mile (0.8 kilometers) from the road along the wash bank. Remnants of Tropical Storm Rosa have brought heavy rain and flooding to parts of Arizona. On Wednesday night, a 26-year-old woman from France was killed when she was struck by a pickup truck along a stretch of a northern Arizona highway that collapsed from storm damage. The driver crossed the collapsed area and lost control of his truck. Authorities say a fatal collision occurred before a stretch of northern Arizona highway washed out by rain was closed because of a giant sink hole. The Arizona Department of Transportation said Thursday that troopers discovered the large hole that resembles a washout when they responded to an accident late Wednesday night on U.S. 89 near the community of Cameron. The agency says it appears two vehicles collided and one person was killed. An undisclosed number of others were transported to a hospital for unknown injuries. Troopers say one vehicle may have run into the sink hole. Damage from heavy rains has led to the closure of lanes in both directions at the highway’s junction with U.S. 160 about 15 miles (24 kilometers) north of Cameron. Cameron is 52 miles (84 kilometers) north of Flagstaff. 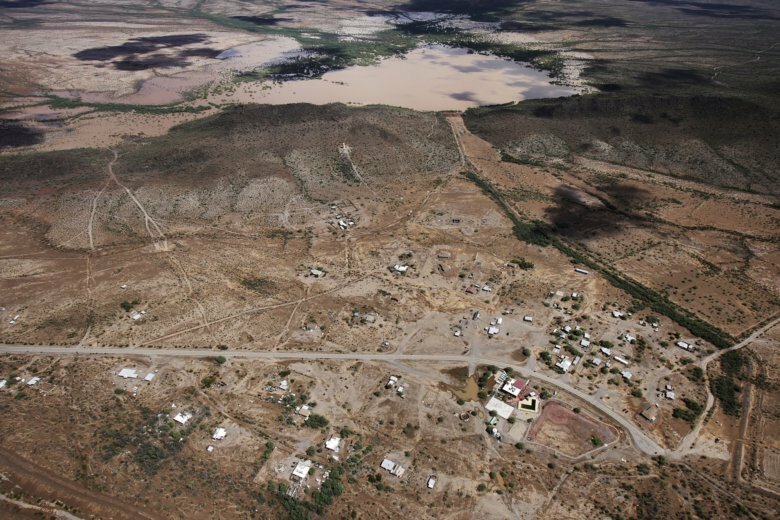 A flash flood warning remains in effect for a small Native American community in a remote area of the southern Arizona desert where authorities say an earthen dam still has the potential to fail because the lake behind the dam is still swollen by recent storm runoff. The National Weather Service on Thursday extended the warning for Ali Chuk on the Tohono O’odham (TOH’-oh-no OH’-tum) Indian Nation’s reservation near the U.S.-Mexico border. The weather service said the dam had “some erosional damage” when it was overtopped by water at some point during or after Tuesday’s rainfall from the remnants of Tropical Storm Rosa and that concerns remained about its structural integrity. Tribal officials said late Wednesday that water levels behind the dam were receding but that its integrity remained “a major concern” and that the tribe is working to assemble an engineering team to inspect the dam. Most of Ali Chuk’s residents have been evacuated or left on their own but tribal officials said Wednesday that a few refused to leave. A 15-mile (24-kilometer) stretch of a northern Arizona highway is closed because of damage from heavy rains and officials say the closure likely will last a while and result in a lengthy detour. The Arizona Department of Transportation announced Thursday that northbound lanes of U.S. 89 are closed in the small community of Cameron and that southbound lanes are closed at the highway’s junction with U.S. 160 about 15 miles (24 kilometers) north of Cameron. The agency says repairs likely will require “an extended closure” and that alternative routes will add about 190 miles (306 kilometers) to a trip. The alternative routes are Interstate 40, State route 87, State Route 264 and US 160. Remnants from a tropical storm that dropped a record amount of rain in Phoenix area now are headed to Colorado and Utah. A separate flash-flood warning was issued through Thursday morning for Yavapai County north of Phoenix because of possible thunderstorms. National Weather Service meteorologists say a record 2.35 inches (5.97 centimeters) of rain fell at Phoenix Sky Harbor International Airport as of Tuesday night. That made it the rainiest October day since records have been kept, topping the 2.32 inches (5.89 centimeters) recorded on Oct. 14, 1988. Meanwhile, a 22-foot-high (6.7-meter-high) earthen dam in southern Arizona that had been at risk of breaking and flooding a small village held steady Wednesday. The lake behind the dam receded after being swollen with runoff from the remnants of Tropical Storm Rosa.